I myself am not a mother, but my older sister Alicia is – she has a 3-year-old daughter Emma. Spending time with my sister and my niece is my favorite thing to do, but unlucky for me I live in Brooklyn and they live in Florida. We do whatever we can to see each other as often as possible, and during the times when we’re apart, I have to live vicariously through the pictures and videos that are sent my way. It’s probably aunts and grandparents just like me that cherish these photos the most, and I often flip though them on my computer or phone when I’m feeling “off” and need an extra dose of love. With all the photos and moments that have been captured over the past three years I can look back at all of the silly, wonderful things Emma and I have done together. I also get to see what she’s up to when I’m not around. These memories however are not just time spent with Emma, they are also some of the best moments I’ve shared with my sister. Alicia is seven years older than I am, so when she first got pregnant my obvious response was, “We’re having a baby!” Like all new moms, Alicia had a lot to learn and right from the beginning I was there to help as often as possible. From watching how-to videos on getting your newborn to stop crying (by the way, this entails a combination of swaddling and making sounds like a womb while simultaneously swaying and rocking), to building a crib and Molly Dolly’s first New Year’s (one of Emma’s dolls deemed our honorary guest) there’s never been a shortage of laughter. In addition to working for Inhabitat, I’m also an artist; I studied illustration in college and have been painting ever since. Alicia recently sent me some Emma pics that are now hanging on my refrigerator. 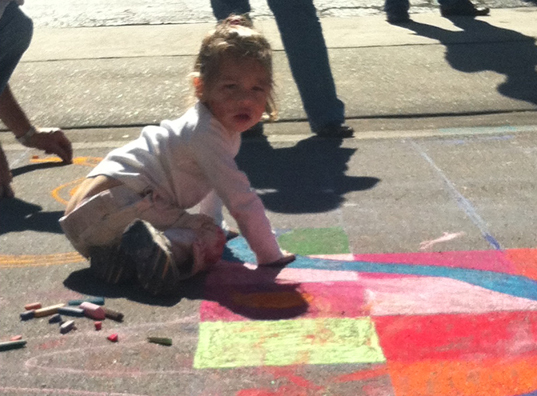 Of course they were adorable like all of the others, but in these photos Emma is head to toe covered in chalk. From her face to her finger tips my little Monet had made her mark. She’s always been a girl after my own heart, but these pictures prove (just as I had suspected) that we’re kindred spirits. Whether it’s capturing a fleeting moment or making new ties through sharing, photos can be a record of what holds families together. It’s hard to imagine not having the convenience of a digital camera or a phone to just take a quick snapshot, but we should try not to take this technology for granted, because without it we might haved missed out on some really good stuff. 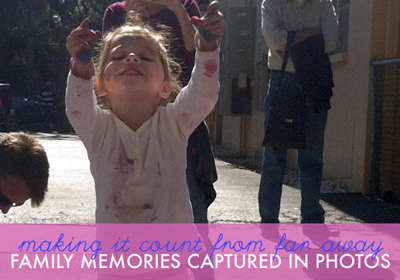 Do you capture your favorite family memories through photography, too? If so, share them with us! We’re partnering with Federated Media to challenge you to send us your favorite photo memory showcasing a special family moment, and we’re especially interested in seeing how you’re sharing your love for green design with your little ones. We’ll pick our favorite photo based on creativity, image quality and its ability to tell your story. The winner will take home a fabulous $500 Best Buy gift card! It’s easy to enter, and just think about how nice it would be to have an extra $500 to spend on your friends and family this holiday season, or maybe just buy an iPad for yourself! 1. Upload your favorite design photo(s) to Flickr.com and tag them #CapturedPhotoContest_Inhabitat. 2. Important note: Be sure to make your pics “public” so that we can see them. 3. Comment below with a link to your Flickr photo and a short description of what it is. 4. You may submit up to FIVE photos between now and December 24th. We’ll be judging them based on creativity, image quality and storytelling-through-photography. The contest ends on December 24th at 11:59PM EST and we’ll be contacting the winner through Flickr Mail around January 16, 2012. This Captured Series is brought to you by Best Buy. Get unbeatable prices on all digital cameras to capture your family memories this holiday season! http://www.flickr.com/photos/cpwebb/6516720845/in/photostream on my 42nd birthday, my wife and I took our daughter to her first zoo visit. Juxtaposed her nibbling on my wife's finger with a warning about the animals. http://www.flickr.com/photos/addicted2traveling/4629429677/in/photostream/ http://www.flickr.com/photos/addicted2traveling/4629430453/in/photostream/ http://www.flickr.com/photos/addicted2traveling/4630029856/in/photostream/ I am a product design engineer and am obsessed with beautifully designed toys and especially ones founded on green design. My dream is to surround my son with beautifully made and inspiring open ended toys so that he can explore and learn through play. One of the toys we bought him that has brought much joy is this adorable push wagon from Kaiku. This toy has been a shopping cart, doll buggy, race car, just about everything. Lukas got this before he could fully walk and loved to ride inside while being pushed around the house. This picture shows a our son Lukas with this best friend Dash. Though Dash isn't family by blood we consider Dash and Lukas to essentially be brothers since they have been inseparable since 1 month old. Normally Dash, who is a full head taller even though the 2 were born on the same day, is the one pushing Lukas. But on this day Lukas was finally strong and stable enough to be the the one doing the pushing!! The joy of this achievement was captured in this photo and the wide grin on Lukas's face. The boys spent the afternoon taking turns pushing each other across the room giggling and laughing the whole way. http://www.flickr.com/photos/[email protected]/6522026419/ http://www.flickr.com/photos/[email protected]/6522020781/ http://www.flickr.com/photos/[email protected]/6522025105/ These are just a few photos of me falling in love with my daughter every second as we explore outside together....some of our most cherished moments. http://www.flickr.com/photos/[email protected]/6478029269 After having two big sisters, my son was thrilled when our youngest was born and he got to be a big brother. Even before he could read, he loved to sit there with books and pretend to read to her, looking at pictures and making up crazy stories. I tried to film him telling one of those stories once, but it went on for over ten minutes. I caught this picture of this perfect quiet moment where, not only was my son reading to his baby sister, but he was even doing so while wearing his "Big Brother" t-shirt. As for sharing a love of green design, well, you'll note the baby's in a cute cloth diaper. http://www.flickr.com/photos/[email protected]/6532174463/in/photostream This is the last memory that I have of Josefina, my goddaughter and the first child of my best friend Maria Jose. I took this picture the night before they left for Vancouver where Maria is pursuing a graduate degree in environmental design. I love to look at this picture and hope that both of them are gaining the most out of this amazing two-year experience of living in a green and vibrant city and that they will come back to Chile where we need them the most full of great ideas and their endless happiness and enthusiasm to implement them!!!!! http://www.flickr.com/photos/[email protected]/6532182049/in/photostream/ http://www.flickr.com/photos/[email protected]/6532181997/in/photostream/ These are just a few of the pictures captured of my husband, Brian, deploying to Iraq and the day he came home last week! We live thousands of miles away from family so these pictures are important so everyone can see the excitement and memories these days bring. The picture of the day he came home is the first time he saw his son, Elijah, walk. He walked straight to him and had a huge smile on his face. While deployment day is always the hardest for any military family, nothing can beat that day when they are back into your arms and your family is whole again. I myself am not a mother, but my older sister Alicia is - she has a 3-year-old daughter Emma. Spending time with my sister and my niece is my favorite thing to do, but unlucky for me I live in Brooklyn and they live in Florida. We do whatever we can to see each other as often as possible, and during the times when we're apart, I have to live vicariously through the pictures and videos that are sent my way. It's probably aunts and grandparents just like me that cherish these photos the most, and I often flip though them on my computer or phone when I'm feeling "off" and need an extra dose of love.